We are often asked what is the difference between a physiotherapist and a chiropractor, an osteopath and a sports therapist? Most muscle or joint aches and pains, back pain and neck pain can be seen by any of us. The major difference is the approach these therapists use. This blog is based on what we do, as physiotherapists. Physiotherapy is a legally protected title with the Health and Care Professions Council (HCPC). You cannot practice as a physiotherapist, or call yourself a physiotherapist, without being registered with them. The HCPC have high standards which physiotherapists must adhere to and can be audited to prove this. In 1977 the profession received Royal Chartered status and gained autonomy. This means that we have freedom to diagnose and treat as our assessment and clinical judgments direct us. Physiotherapy is an evidence based profession. Recent research is disseminated throughout all 55,000 qualified physios in the UK. Part of the Standards we adhere to is to keep up-to-date with this research and provide the most current evidence based practice. For example, if we don’t use ultrasound for your back pain, it’s because the research does not support its efficacy in your condition. What knowledge do physiotherapists have? You must complete a 3 year BSc degree in Physiotherapy. This provides a wide background knowledge in all areas of the body and injury, illnesses and diseases. They have a large base of knowledge on how these conditions have an impact on our bodies and other conditions you may have. They also have a large base of knowledge on the impact emotions and stress play on the body’s response to pain. This means they provide a holistic approach to care. Physiotherapists don’t just look at the one issue you may be presenting with. They also look at how other physical and emotional strains can be affecting you. We have worked with acutely ill people to post operative. We have worked with people who have had gastrointestinal or othopaedic surgery, head injuries to ankle fractures. 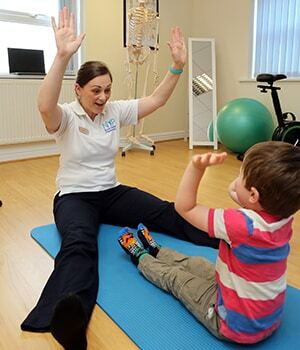 We have a wealth of experience, learning as we went along from specialist physiotherapists. This stands us in good stead to be able to emphasise and understand everything about the person in front of us, not just the small part of their body they have come in with. At North Yorkshire Physiotherapy we have physiotherapists who specialise in different areas and have a more thorough knowledge of one particular discipline. Therefore we often work together for the benefit of the client. For example, we may be seeing a client with back pain who also has Multiple Sclerosis impacting on their pain. Charlotte and Kate may both work with the client to maximise the benefit. What approach do physiotherapists take? The body is resilient but sometimes needs a helping hand. When in pain, maladaptive behaviours and movement patterns and postures can occur. This can lead to alterations in joint movement and muscle activity, hindering recovery. Evidence shows that correct movement is the one most beneficial things to aid recovery. We believe correct exercises for your condition and managing it yourself is how to achieve this. We believe in educating and empowering the individual to care for yourself. Do physiotherapists use manual therapy? Manual therapy is used in physiotherapy to correct a maladapted nervous system and guide a return to normal movement. There isn’t the evidence to suggest that we are “re-aligning” the body or putting something “back into place”. We are giving a correct input into the nervous system and the tissues in the body to help correct itself. Think of this like “re-wiring”, followed up by the right exercises to maintain and build on this. What used to be known as musculo-skeletal physiotherapy is now called neuromusculoskeletal to recognise the importance of the nervous system in muscles and joints and injury and pain. Occasionally you might hear a “click” during manual therapy. This is the sound of the pressure change as fluid moves from one place to another. This produces a release of endorphins which help to provide pain relief. All of this accumulative effect provides your body with the confidence to move which is the key to the healing and recovery process. There are many other treatment techniques we use too, including exercise therapy. We will provide you with an individualised exercise programme. We may also use electrotherapy (such as ultrasound , a TENS machine or elctro-muscular stimulation), taping or acupuncture. Physiotherapists can guide your recovery, giving you realistic expectations and rehabilitate you to your full potential. We don’t just aim for short term relief from symptoms. We correct the body to help prevent it occurring again and give you the tools to manage any potential flare up.